Rangi was just trying to help me out with my hack I'm working showing me how to insert tilesets. But we've been having issues using "make". We've even tried deleting the copy of polished crystal I had entirely save for my edits. Then I had no problem building the rom. Everything was perfect. So after I did, we decided to "make clean" and add my edits. Shortly after I made clean, I noticed a lot of my map asm AND blk files are getting deleted everytime the "make clean command is used" However there is no indication in cygwin that it does this. Is there a reason why "make clean" would delete files. 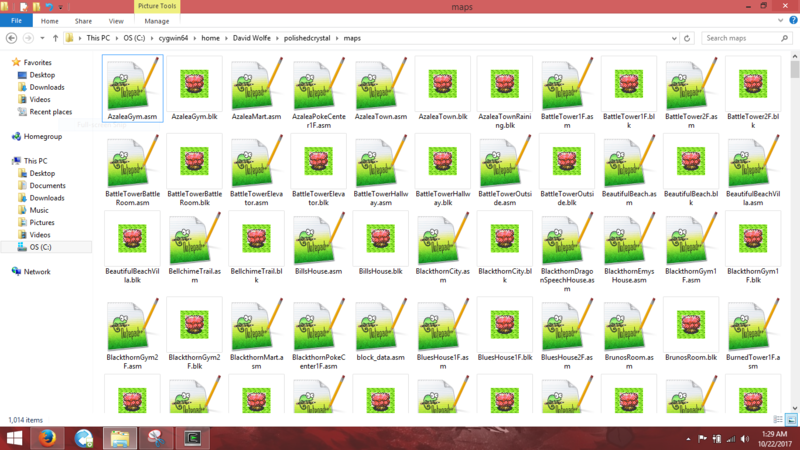 And just to be clear, I have all of the "make" programs and downloaded and nothing has changed or has been deleted thay. So there really is no real explanation for me & Rangi. We'd like to know why I'm losing files for the sheer heck of it. There is a problem with Windows and cygwin not cooperating when there are inconsistencies in the capitalization of your file names. I suspect this could be the cause of your problem. When the case of an INCLUDE statement doesn't match the case of the file name, building still works because the Windows file system is case-insensitive. This "fools" Make into thinking the map .asm and .blk are "intermediate" files (files created by making and files that are safe to delete whenever). Not sure specifically why this bug happens. It just happens as a result of Unix files systems being case-sensitive and the Windows file system being case-insensitive. Make sure all your file names and their corresponding INCLUDEs (in maps.asm and maps/script_data.asm) have exactly the same case. That's my only guess right now.